Editor’s note: With the test mule spied recently, we decided to rehash our list. The launch of the newly styled Toyota Tundra has got fans of its little brother excited to finally see some changes. Even though there probably won’t be too many exterior changes, we think the interior is ripe for a complete make over. Here is our list of our changes that we could see, we would like to see and probably won’t see. A new Tacoma is coming soon! Here is what to expect. New Engine Options – The Tacoma engine has been a stalworth for a long, long time. However, it is dated and doesn’t seem like Toyota can really improve on it a whole heck of a lot. How about offering some new engines? We think it is time and you can expect to see some changes in this area. Illuminated Knobs – One of the most requested items we heard back from our Facebook fans and forum questions is the need for illuminated knobs. This seems like a simple thing that could be added easily. With Toyota utilizing more focus groups, it seems likely someone would mention the need for this. Luxury Trim Package – Like it or not, the luxury trim packages are huge profit generators for truck makers. We could see Toyota come out with a luxury trim package that would include multiple-way power-adjustable seats, leather trim, heated seats/steering wheel and custom styling in the interior. Plus, this package could come with trim details on the exterior and color choices. It would also likely include more chrome throughout. Modified Exterior – Odds are high that like the Tundra, the Tacoma will be sent to a wind tunnel. This results in a more streamlined truck with modifications to the exterior panels to reduce drag. We will probably also see the Aero Fins that the Tundra has. There will also be a lot of time spent on reducing the gaps on the body panels to reduce drag. 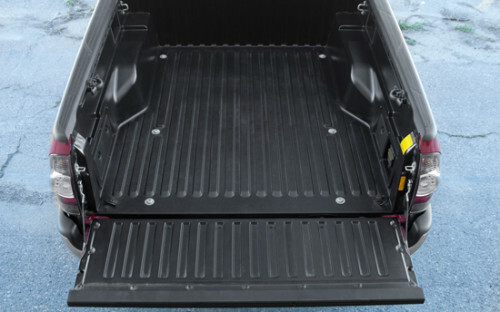 Finally, could we see the stamped tailgate that the Tundra has? Probably so. 6-Speed Automatic Transmission – While we don’t have this confirmed by any means, it is very, very likely that Toyota will offer more speeds on the transmission. Why? 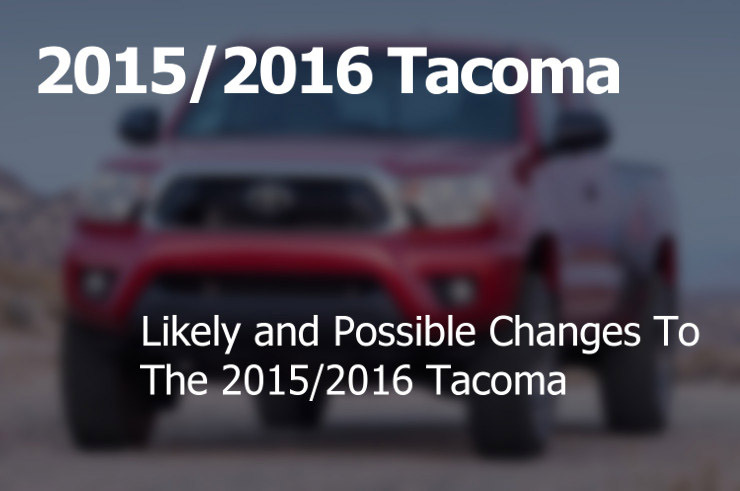 CAFE regulations start taking effect in 2016 which means the Tacoma simply MUST get better gas mileage. What is an easy way to get there? More speeds in the gearbox resulting in lower RPMs which results in better MPGs. Pretty simple actually. Sliding Rear Window – Come on the Crew Max Tundra has the really cool sliding rear window, why doesn’t the Tacoma? That would be a cool feature. Heated Mirrors – This is a really nice feature for about 1/2 of the country. It could be an option – that’s all we are asking for. Larger Cup Holders – The reality is that cups are getting larger, why are the cup holders so small? Payload Increased – This is probably going to happen with the on-going towing wars of the truck makers. Everybody is working on improving the towing and payload ability of all trucks and we think the Tacoma will see some improvement as well. Will it be a lot? Nope, but it will be a minor increase. Want a longer bed? Forget about it. Larger Bed Options – It seems most Toyota truck owners want more bed options like larger ones in the crew cab models. While this would help a lot, we just don’t see it happening thanks to a combination of CAFE requirements based on square feet as well as production issues with offering it. The truth is that the owners who want a longer bed are really still in the minority and the increased cost to produce them doesn’t add up. Increased Manual Transmission Options – The manual transmission has a lot of fans out there, however, it doesn’t have a lot of fans among truck makers it seems. Every year, we see less and less manual transmissions offered. This is really due to the improved abilities of the automatic transmission closing the gap on any advantage of the manual transmission. Plus, the majority of truck buyers aren’t buying the manual. There will still be some trim lines offering them, but they will become fewer and fewer. Diesel Engine Choices – Many owners are hoping the new Tacoma will come with a diesel or a diesel-electric hybrid option, it remains to be seen. The reality is that the Ram 1500 will be the first truck offered in a diesel in years. If it sells really well, you can expect Toyota to seriously consider offering one. If it doesn’t, then that just adds to the automakers case on why they don’t offer them. The jury is out as they say and we will need to see some sales figures before we can speculate any further. New Interior and Dash – the new Tundra has it, why not the Tacoma? We would like to see the deep gauge cluster to disappear and be replaced with a more open display. While the clusters have done well, it is time for the Tacoma to join the rest of the crowd and create a more market competitive instrument display panel. Larger/Smaller Size – Most truck makers are trying to figure out how to take market share away from the Tacoma – the perennial sales leader in the compact or mid-size truck market. There is a lot of talk about coming out with a new size category actually and really splitting the segment into the compact (think 80’s Tacoma) and mid-size (current Tacoma). The argument revolves around CAFE regulations of fuel economy, consumer demand for trucks that get 30+ mpg while getting back to an “urban” truck that you can park anywhere. One of the criticisms of the truck market is that all the models have grown to big. Will all that said, we don’t expect Toyota to mess with the Tacoma. However, the timing is getting better for a new truck to hit the market as truly a compact option. What do you think? Is there something we missed? I love my Tacoma, and it gets regular “truck” use, but the one thing I hate is the lack if climate control. If they are likely to update the dash, why not go with a 4Runner dash and give us all some climate control. If my Altima can have it, there’s no reason a Tacoma shouldn’t. Agreed! I really want to see a new dash for the Tacoma personally. Also, I don’t understand why they can’t offer at least one trim level with all the bells and whistles. Doesn’t make sense to me. Improved fuel economy should be the number one priority! The new full size trucks are offering comparable MPG, that is not acceptable! V6 with same or slightly higher torque number. I would think it would need dual VVT-i and direct injection to increase MPG. I4, I believe really needs more hp and torque to be more fuel efficient. It seems like this engine really works to move the Tacoma. I would really like to see better range out of my Tacoma. With more efficient engines and perhaps 2 more gallons of gas capacity would make a big difference. Would like the gauge cluster to include information such as outside temp (standard! ), ave mpg, fuel range, each tire actual pressure etc. Agreed. Improved MPG is a target for all automakers. Frankly, there has been zero competition pushing Toyota to make any changes. However, with new CAFE standards going into effect in 2016, we should see some MPG benefits. As to the other items, really can’t say why they haven’t put them in yet. They MUST add a power sunroof to the limited and I really like the idea of a power rear window like the crew max tundra. Interior upgrades already discussed in this forum are badly needed as well, especially for the limited model. Finally would like to see a bod redesign similar to the tundra, tacoma is tired and dated now especially the back end. Waiting to buy the 2015 but won unless these changes are made. Wanted a Ford Ranger but they would not sell me one so got a 2012 Tacoma. Love the power increase. Love the 4 wheel drive. Love the rear camera. Very disappointed when I found out the radio did not have RDS, been waiting 10 years for that in my ride ever since my wife’s 2003 Windstar. The most basic radio should come standard with that. Did not have rear disc brakes I paid for them well at least it felt like I did. The only complaint I really have is the standard options for the price paid. No Rear disc brakes…Not that it helps that much in stopping just easier to work with and like I said I “paid” for them. No power siding rear window. If you buy anything other then standard cab that should be standard option, if you order sliding rear window. Mine has never been opened as I can’t reach it. The 4 wheel drive selector is hard to find in the dark well I’m used to it now since I turned it to 4 wheel drive by mistake when I was wanting to increase air flow; I now know what to look for. I think it should have been on the other side of the steering wheel and illuminated. Pulled my wife’s Windstar on a trailer no problem run well. Just lacks options for the price. My neighbor paid $41,000 for his and he still did not get disc brakes on the rear. I own a 2012 Tacoma but I will be trading for a 2015 model. To keep me from buying a Ford F150 EcoBoost V6, this is what I need in a future Tacoma. Not like 2014 4Runner in any way! More body-color or black trim like the current SR package or like the former Tundra TRD Rock Warrior. More solid (clear coat) paint colors like what is offered on FjCruiser and Wrangler. I’d prefer slower 0-60mph with more towing capacity and better mpg anyway. I will not be buying a new Tundra because the mpg is too low and I think the new exterior design is ugly. The Ford F150 FX4 looks attractive and has the excellent V6 engine. For the price, Tacoma does not offer enough features to keep me in a Toyota in 2015. Without better fuel economy the Tacoma will go the way of the Ranger. Unless I missed it, I didn’t see anything in the possible changes/upgrades to the 2015 Tacoma regarding LED running lights. It appears that Toyota added LED running lights to the 2014 Tundra. Do we know if Toyota will be incorporating new LED running lights in the 2015 Tacoma headlights like they did in the Tundra? I want 4 wheel DISC BRAKES where are they??????? I hate adjusting the shoes and they dont do it on their own even when you think they are. what they need to do is raise that rear view mirror up. and remove that black trim on the fenders! I4 turbo diesel backed by an 8-speed auto…no excuses for the full-sized trucks getting better MPG. The hi-lux diesel setups exist everywhere else, so why not here? Higher end options: leather, dual climate control, etc. If all the above are done to the Tacoma soon, I’ll seriously consider buying another as my next truck. If not, I will be buying a 1/2 ton. As of right now I am considering the Tundra, but favoring the new ecodiesel Ram.